Flowers are the nature's best gift to us. Flowers are thus an excellent gift which you can send to your loved ones on their special occasions and make them truly happy and feel special about themselves. There are some of the life's greatest pleasures in seeing our loved ones happy and make our loved ones love us all the more. If you are staying in a foreign land and you want to make your loved ones happy, then sending them flowers as gift to India is a nice option. GiftstoIndia24x7.com is an online gifting firm that lets people from all around the world send gifts to India. We also specialize in online delivery of fresh flowers to India. Flowers are some of the best choices for gifting to one's loved ones on their special occasions. Flowers symbolize life and a new beginning. On every important occasions like birthdays, anniversaries or other events, flowers play an important role in bringing life to every celebrations. At GiftstoIndia24x7.com, we have got some of the widest range of flowers and flowers arrangements which will surely bring the smiles on the faces of your loved ones. 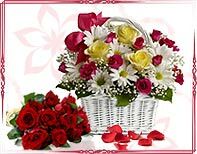 Besides the collection of some of the popular flowers like roses, Gerberas, Carnations, Lilies and Orchids, we have also got some of the most exclusive flower-arrangements which you can send to your relatives as gifts to India. The flowers will show up at the door-step of your loved ones right just in time for the festivities and your loved ones will be thoroughly excited. Make the distances disappear with just a click of the mouse. With the turn of the century, many new developments have shaped the new world. Globalization has led to rapid developments in the Indian economy and many new multi-national companies have set-up their bases here. This has made many individuals leave for the foreign shores for various career-related commitments. As a result, they are missing out important family occasions. They want to be near to their loved ones, they want to convey to their loved ones their deepest respect and warm wishes on their loved ones' special day. Sending flower to India through our website is so much easier now. There are some of the choicest of gifts that can also be teamed up along with the flowers for that added effect. Gifts such as perfumes, cakes, watches, cards can be sent to your loved ones and you can be rest assured that your loved ones will be truly floored. Flowers have got the innate ability to brighten up the mood of the person who receives them. When you are away from your loved ones for months on end, your loved ones' hearts yearn for your return to India. Your love in the form of flowers and other gifts will surely reassure your loved ones that no matter how much busy you become, you will always remember them. Our 24x7 customer support keeps you updated about the delivery status of your gifts and also ensures that your gift reaches your loved ones just in time for the festivities. Making your loved ones happy is so much easier now. Send the choicest and the freshest flowers to your loved ones as gifts to India from US and make them yours', forever.